A memorial plaque dedicated to former Norden Councillor Ann Metcalfe was unveiled on Wednesday 12 March at Whittaker Moss Primary School, where she had been a governor. 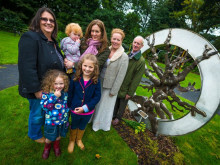 The plaque was revealed by Cllr Metcalfe’s partner Alan Barlow, daughters Sarah Metcalfe and Emma Metcalfe and grandchildren Theo, Felicity and Whittaker Moss pupil Jonty. The Norden community gathered in Jubilee Park to pay tribute as a wishing tree was unveiled in memory of Councillor Ann Metcalfe.